Who should host 2018 and 2022 World Cup? It is one of the biggest sporting spectacles on the planet and every four years, someone can call themselves hosts for the FIFA World Cup. Brazil will be the next host in 2014 - just two year before the country hosts the summer Olympic Games. The decision for the 2018 and 2022 World Cup will be announced this Thursday, but the bidding process has already been overshadowed by allegations of corruption and bribery. Cameroonian Issa Hayatou was one of three FIFA officials - including Nicolas Leoz from Paraguay and Ricardo Teixeira from Brazil - who were named by the BBC as having taken bribes from the ISL marketing company who went onto secure valuable World Cup rights in the 1990s. The BBC has been criticized for airing the damaging program just three days before FIFA members are to vote on a winner. The other countries vying for the 2018 World Cup are Russia with joint bids from Spain and Portugal and the Netherlands and Belgium. While the 2018 tournament is sure to go to a European country, the continent for the 2022 World Cup is much less certain. South Korea, Japan, Australia, Qatar and the United States are all in the running for the tournament which are more than a decade away. Japan and South Korea jointly held the World Cup in 2002 so are seen as an unlikely choice. Australia and the United States are being viewed as the favorites, but FIFA may choose to award the games to Qatar as a middle eastern country has never hed the tournament. Do you think that these allegations of bribery that aired on British television will hurt the England's chances of holding the World Cup? What country do you think will win the 2018 and 2022 bids? What will the World Cup mean to your country? Please leave your predictions and comments below and be sure to tell us where you're writing from. 2018 spain,portugal and 2022 Australia indeed. It should be Spain – they just won the cup! Then maybe Portugal, England I don't think so. I agree wholeheartedly, it should go to countries that have never had it. Russia 2018, Qatar 2022. I would give it to North Korea! I think the current problem lies with the voting system. Right now, only the Executive Committee decide and that gives rise to the problem of corruption. FIFA should take a leaf from the IOC where all member nations get a vote to decide the eventual winner. Personally, I'd like to see England get the 2018 WC and Australia the 2022 one. England NO, Spain & Portugal will be better. For 2022, South Korea, Japan, US & Australia had hold several international competions in the past, including the World Cup. NOT AGAIN NOOOOOO! Let it be Qatar, it is fair for the Middle East to hold a World Cup at least once, it is about time! I, and more Dutch people, don't want this bunch of corrupt FIFA officials telling our government want to do. England can have it, they seem to want it the most, as even their media condemn journalists that report about corrupt English FIFA members, because it might harm their bid. I'm in Perth West Australia, I hope that we get it 2022, and I would go for Russia 2018..Aussie Aussie Aussie Oi Oi Oi !!! Qatar – in the middle of the summer, are you guys dreaming? Russia – too currupt and they are already have a successful league. OZ – too far for fans to go to games from one side to the other. UK – 2018, first time since 1966 (did you know they won that year? they are still talking about is -blah, blah). The infastructure is all there and the weather is not too bad for June soccer. It has to be Russia for 2018 and Australia for 2022. The US, Sth Korea and Japan have all had it before, and Qatar is just too small. They should have had a joint bid with its neighbours. Netherlands – Beligium. Holland has the best football fans in the world!! I am Australian, my wife is American and we live it Qatar... while we would both love our respective countries to win, I honestly believe there could be no better decision than to have Qatar win. This is a land of people who are passionate about football, take great national pride and they would put on a wonderful event. Qatar all the way! never Russia, they are racist and fascist and should not be rewarded! Belguim/Holland or England for sure! Qatar for 2022 is a must guys ..it has to be ! Hopefully the Middle East would have settled down by 2012, there is that issue of terrorist threats. It would be good to see an event of this magnitude feld in that part of the world. I think England should withdraw to show intergrity in refusing to get involved with a corrupt organisation. Other nations who continue to stay in the bidding would then be forced to reconsider the detrimental effect staying involved would have on their own standards and integrity. The English league did well enough before FIFA was around.. it can do so now. Blatter and his cohorts need to be taught some humility and honesty. Russia should be able to hold a WC however, why hasn't the gov't put in its bid? There must be a good reason why they haven't. As for 2022, although Oz is far and wide (going to and from within) I believe its best for the sport to hold its grandest tournament there. NZ and Australia are slowly becoming more competitive and a WC there would be a great showcase and bring a sense of pride to the Oceanic region. Qatar is too hot – 'nuff said. I think that would be a good idea that Spain and Portugal host the 2018 FIFA World Cuo becuase Spain is the current Champion and Portugal stars to play really good, also Qatar is a verry atractive opcion for the 2022 FIFA World Cup, this because the propousal that they did regarding the soccer stadiums that they wuold built for this huge event and that it will be the first time that a country from the middle eastern host something like this. 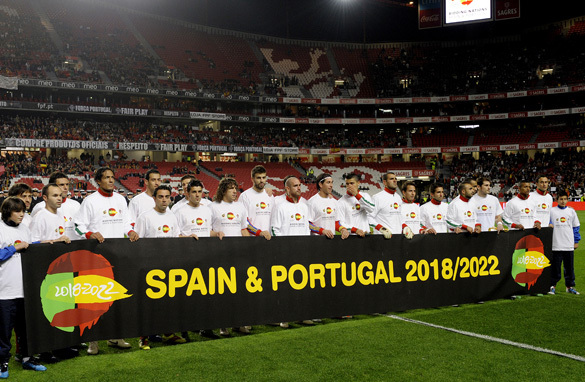 2018–Spain/Portugal, the last split WC was a complete success and having it in Spain could boost the economy to the point it really needs to succeed as a country. 2022– USA, the country that will be one of the bigger futbol power houses by that time could use a home field advantage to see it reach its first WC finals for the first time. As well as solidifying that the country needs to realize futbol is a beautiful game. So i'd say give another country a shot. Russia seems interesting, however they have no experience hosting a simular event, let them get some experience hosting the European Championship first. Holland and Belgium together hosted the Euro2000 event which was really successfull, i think they are ready to host the World Championship now. Qatar in summer... you must be insane? Oh well.. i do expect the Qatar people to come up with a cooling solution since money is not an issue... first airconditioned games ever? The US hosted the games in 1994. Japan hosted it together with Korea in 2002. I don't want to be in Korea when the North is action like it does now. Australia in European summer is actually winter there, so i think the right kind of climate. The problem is, it's damn far away and the time difference makes for annoying viewing times for the Europeans. Still Australia gets my vote. Qatar would actually be a good choice. No other country would be as pressed to put on as good a show as they would. And for those complaining about the heat, Qatar has already put into work, plans to 'air-condition' all the stadia and public places. If it's anything like the Emirates, I know they can pull it off. Qatar should not get it, cos the hosting nation automatically qualifies for the final round. Qatar definitely is not gud enough to be there! I prefer Spain and Portugal as co-host nations if we want to see world football at its best in decades. Hola!! Having the world cup in Qatar will do wonders for this country! it should be KOREA, they have excellent infrastructure for the world cup 2018, besides they have to co-host with the JAPS. I'd really like to see a successful cup bid from Spain/Portugal or England for 2018. Great fans and venues. As for 2022, the Australian bid is going to be hampered by the inability to ensure that the other Aussie sports will be on break during the WC. I think it's between Qatar and the US. Qatar, listen up: find 5 of the most vulnerable (African of south American would do the job) FiFA body members, bribe the heck out of them, take them to strip joints, get them drunk and heck and the WC is yours, I guarantee you, this is what the US and Australia will be doing. You adds on Jazeera are worthless!!! Russia and Qatar to get the world cup? No way, the countries are poor and viewing times for games in the USA would stink. The cup should be held in England/USA rotation, all the time. Us anglos dominate the world! Share it around the world. That's easy, whoever pays the most. Seriously, in light of Spain and Portugal's economic issues, FIFA would be insane to award it to them. England is much more stable. I'd hope for the US in 2022, but Australia would be a very interesting choice that might get support. S. Korea has no hope especially with all going down lately, and Japan cannot handle the amount of tourism. "Russia and Qatar to get the world cup? No way, the countries are poor". Darth Vader, do you actually know what you are talking about? Qatar is the second richest country in the world. Anyway, the most logical choice is The Netherlands/Belgium. Mainly because we the Dutch have lost 3 WC finals now, and sort of "deserve" to have this event in our country. I'm hoping that then, finally, in 2018, we will score a home victory and get our first title. Russia is a corrupt maffia-state, and England is already a succesful football nation; they don't need this. Spain just won the WC, so it shouldn't complain either. hey, KOREA!!! 2022! FIGHTING! JUST TRY!EVEN IF YOU CAN NOT ACHIEVE IT! BUT IF YOU CAN, IM PROUD OF YOU, BECAUSE IM SOUTH KOREAN! YEAH! For all: there's No Coruption in these countries! Qatar in july,it´s SUMMER !!! got to be kidding. Countries like Russia should not be allowed to host the World Cup (as suggested below) as long as they continue to murder journalists, supress free speech and enable right-wing vigilante groups to murder and attack minorities. And for all you people that want qatar to win. Do u seriously believe qatar stands a chance? I can come up with billions of reasons not to go there. i'ld say ENGLAND for 2018 and QATAR for 2022.the english do have the best and strong chances owing to their strong presentation while for qatar,just as in the case of SOUTH AFRICA(africa as a whole),the middle east also deserves the right to host this world class event for the first time.i think this is objective enough. The middle east is obsessed about soccer, the gulf especially. It would be nice for all these people to get a chance to watch the biggest football event without having to worry about getting a visa (as oposed to the united states andaustralia).. also for everyone saying its too hot.. qatar will do watever it takes to eliminate that problem, even if it takes covering the sun. How could 2022 go to anyone bar Australia??? The USA, South Korea and Japan have hosted it recently, while Qatar would be a risky choice. At least you know that Australia will do it well, they always pull off the big events. Unfortunately, money may get Qatar over the line. But Australia seems the only logical choice to me. I'm German so I recently experienced the 2006 one here, it was amazing. It's about time the cup comes back to Europe in 2018! I totally think England should have it, they didn't have it for so long, plus they truly live football and it's where the game comes from!!! In 2022 I favour Australia or US. Most importantly NOT QATAR!!! These Arabs think they can buy everything; they'll go there on Thursday like "we are going to build 20 new stadiums, and after the cup we are going to convert them into shopping malls"
And then we, the fans all go there and then probably there's not even beer! Fans from the UK can be there in about one hour. Hey guys guess what, the 2022 World Cup will be held in Qatar! SO WHO WANTS TO GO???? Qatar, is essentially just a city-island. Like Hong Kong or Singapore. Not really the kind of place suitable for hosting a world cup. And I don't think fans would be all that keen to visit. The Western hemisphere deserves it. By 2022, 4 of the last 5 World Cups will have been held in the East, and 5 of the last 7. With South and Central America in the West as well as the rising audience in the USA, they should be able to get the World Cup in their time zone more than once every 20 years. The World Cup needs to go to the Western Hemisphere and the USA. I Vote for my home country The Netherlands, and the sharing host nation Belgium. SPAIN & PORTUGAL 2018, Australia 2022, USA 2026!!!!! The host of the 2018 WC should be England, and no country other than Australia would be an ideal place to host the 2022 WC. Aussie Aussie Aussie, OI OI OI!!! If Greece can afford it by then, it would be a perfect venue! We have everything still in place from the Olympics. Let's hope all the infrastructure doesn't collapseby then, from the lack of funds to maintain them.